There's an old saying: the best camera is the one that's with you. The D5500 is designed to always be with you. It's small and lightweight (just 420g), so you won't mind taking it along. Its strong and durable (thanks to a monocoque structure featuring long-fiber reinforced thermoplastics), so you won't worry when conditions get rough. Its ergonomic design and deep grip is comfortable and stable in anyone's hand; and easy-to-use controls will have you shooting the pictures you've always wanted in no time. Cinematic storytelling is at your fingertips with the D5500. Capture Full HD video at a frame rate of 60p with tack-sharp details, vibrant colours and high-fidelity stereo sound. An improved full-time autofocus keeps moving subjects sharp, and advanced Picture Controls like Flat and Clarity make it easier to perfect your movies in post-production. 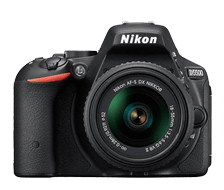 The D5500 is a highly intelligent camera that makes it easy to take great photos and videos. Nikon's innovative Scene Recognition System uses information from the camera’s 2,016-pixel RGB sensor and image sensor to analyze the brightness and colour of a scene. It then compares your shots to a database of thousands of similar shots, and then optimizes the camera settings—white balance, focus tracking, flash information and more—to ensure you get optimal results. Take a series of photos at fixed intervals for up to 9,999 frames that can be combined into jaw-dropping time lapse sequences*. Make a scene look like a miniature model, highlight one colour within a B&W photo, and more. Combine photos of different exposures into one HDR shot. Brighten shadowy areas with Nikon's innovative Active D-Lighting, including a new Subject-based Active D-Lighting that works with moving subjects. Retouch Menu makes it easy to improve the look of your photos. Soften skin tones, highlight a subject, soften a background, crop, create a colour outline and more—all right at your fingertips! Personalize the mood of your photos and videos with the D5500's seven improved Picture Controls. Add vibrance and colour depth, soften skin tones, explore black & white and more. You can even create and save a custom Picture Control for a characteristic that's all your own.